We'll Help you get qualified for Medicaid! 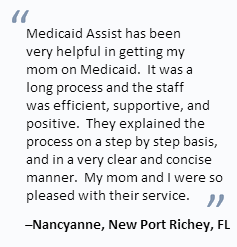 Medicaid Assist specializes in helping our clients get approved for nursing home Medicaid even when they exceed the Florida Medicaid Eligibility Limits. Preserve Your Estate and Personal Assets! You may not need to "spend down" your assets to qualify for Medicaid. We can help you qualify for Nursing Home Medicaid while preserving your estate as we have done for hundreds of other clients. Get Qualified for Nursing Home Medicaid Today! Medicaid Assist can quickly guide you through the complicated and confusing process of qualifying for nursing home Medicaid benefits. We even provide a free checklist of required documents needed to apply. With extensive long term care and nursing home Medicaid experience, our professionally-trained staff has a 100% success rate. We are so sure we can get you approved for Medicaid, we offer a full money-back guarantee! We’ve helped hundreds of clients qualify for nursing home Medicaid benefits and we have NEVER had a final denial!